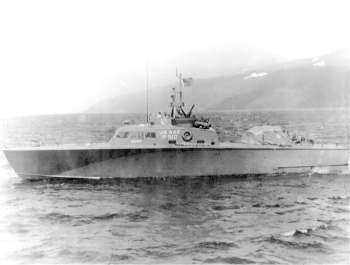 The history of the 11th United States Army's 10th Emergency Rescue Boat Squadron (10th ERBS) actually began in December of 1940, prior to America's entry into WWII. Major Everett S. Davis, Commanding Officer of Elmendorf Air Base, took note of England's Royal Air Force success in rescuing downed air crews in the English Channel and returning them to duty. This started the chain of events that led to the formation of the 10th ERBS. There are many who owe their lives to the crews of these plywood prowlers of the Aleutians. To read a more in-depth history of this unit, click on the "History" menu item. To read about just one of the rescues performed by the crew of ERBS boat P-145, click on the menu item "Loss of 42-40080." The Surgeon's report of the crew of this lost B-24D can be read by clicking on the "Flight Surgeon's Rpt" menu item. To compliment these documents we've set up scrapbooks for the individual contributors to this section of our web site. Clark and Wilber Green (not related) have each contributed much to this section as the first two contributors of 10th ERBS material.